LotusTalk - The Lotus Cars Community > Community > Garage Majal > Garage Storage Lift Recommendations? Looking to add an Elise as 3rd car, but only have space for two! Thinking about one of those lifts to elevate the Elise while parking another car underneith. You'll want to read this thread. 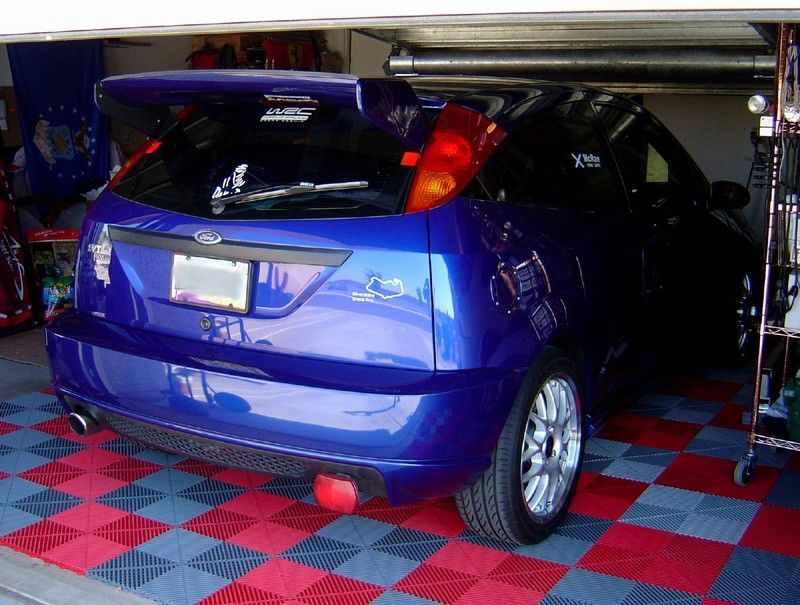 As stated, check out the "Garage Majal" forum under "Community". Lots of info. I have a lift in my garage that I purchased from Eagle Equipment. The lift itself is fine, but it came with terrible hydaulic fittings that immediately leaked. I had to replace all of them. Fortunately, the company I work for has a service shop that made the new fittings for me. Absent that, I would have been a lot more peaved. A couple comments/suggestions on lifts. 1) My garage floor to ceiling height was 9 feet, 3 inches. These seems to be a common track-home garage ceiling height. Such a low height really limits the number of cars you can fit above and below your lift. I can fit my Carrera S and Exige (either one above or below), but anything much taller than the Carrera would not fit. This is not a problem now, but it may have an impact on future car purchases that I make. 2) This is obvious, but ensure that you do not damage either of your cars as a result of having a lift. 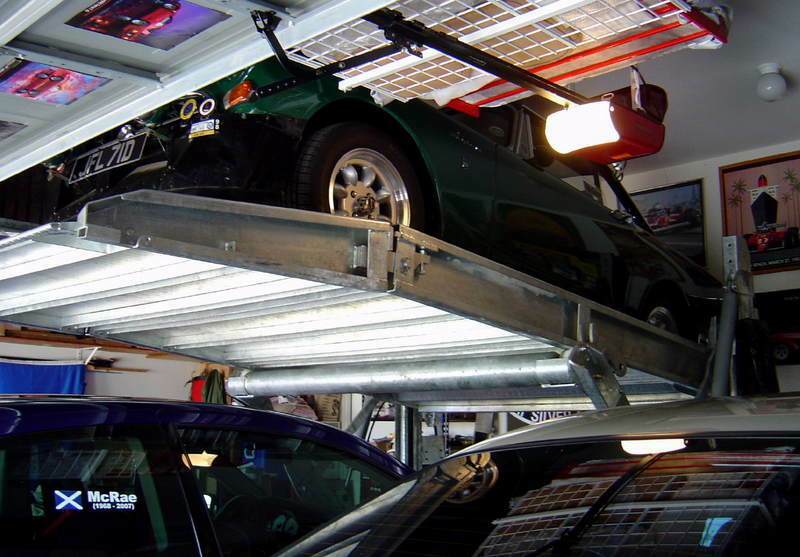 One of the purposes of the lift is to SAFELY store your cars. However, having a lift can greatly increase your chances of causing minor damage to your car. The week I installed my lift, I opened the front trunk on my 911 (while it was parked under the lift) and the trunk lid just missed tagging the jack rail of the lift by about 1 millimeter. I would have been furious if I had dinged the trunk lid. 3) You will hit your head on the lift at least 12 times before you finally learn to subconsciously duck anytime you approach the lift. 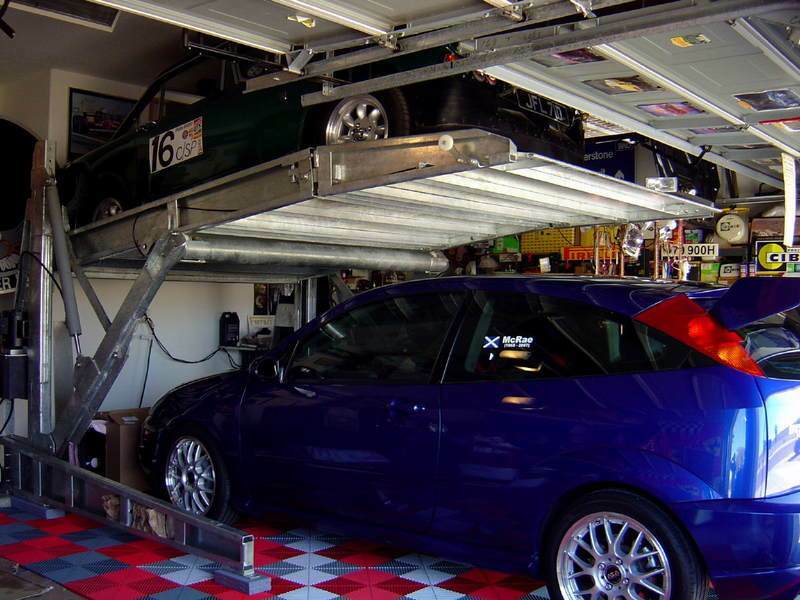 4) Having a lift makes you able to more easily do so much more maintenance on your cars. I bought the lift for storage purposes, but the increased DIY maintenance I am doing on both my cars will probably save the cost of the lift over just a couple of years. 5) Neighbors will think you are extremely cool. Overall, buying a lift was one of the better expenditures I have made related to my cars. I have a 4-post Direct Lift from Greg Smith Equipment. Great product for the money. I have no regrets. My Elise is parked over my daily driver as we speak. Look at the Eagle Lifts. I think they are the best. The one I have, the company is no longer in business...Parking Solutions. yea you should be able to find it thrgh those site. i plan opn trying to have 2 lifts.. ramp type one for storage on tires. and other type frame lift for work needed doing with wheeles off.. There are a variety of lifts on the market that will work for your application. As others on this site have mentioned, there's Direct Lifts offered by Greg Smith Equipment, Eagle and Backyard Buddy. Eagle and Direct Lifts probably offer some of the lowest prices because the lifts they sell are imported from China. Backyard Buddy's lifts are American made. However, their design is what we call an outside slider design. The carriage rides on the outside of the columns opposed the inside like the Direct Lift or Eagle Lift. Personally I like the carriage to ride on the inside because you never have to worry about getting a finger pinched or shop rag caught in the slider. Also because if you ever had to grease the column, you don't have to worry about rubbing up against the column and getting grease on your clothes. BYB may argue their design is safer and better, but it's really a matter of personal opinion. American Custom Lifts offers both designs and are both American made. The rule of thumb to confirm you have enough ceiling height to store vehicles is to measure the total height of the two vehicles you're wanting to store, and then add 10". This is the bare minimum ceiling height required. Also be sure that your garage door won't interfer with the lift operation. There are companies who can raise your garage door tracks for about $600. They also can provide a garage door side mount motor for about the same price. Your concrete should be a minimum of 4", 3000 psi. These lifts are designed to be free standing and portable if you order the optional caster kit. You can also order a jack tray or rolling air jack as well as drip pans and solid platforms. I hope this information is helpful. Good luck shopping! I'm ready for a lift but I keep reading you need to have a forklift to unload it from the truck since that is the customer's responsibility. How have you guys unloaded your lifts? Jose R. - Miami FL -Sell me your AW Elise! 2006 Mini Cooper S 6MT - Astro Black - SOLD! I had it delivered to a local freight depot and picked it up from there. This has two advantages. First, the shipping is much less expensive (or it was in my case). Second, the freight depot will allow you to pick it up on your schedule and they have forklifts. I was going to pick it up on a trailer, but that fell through and I rented a Penske truck with a lift gate. I backed up to their dock, they put the lift (and roller cabinets, adjustable height table, and rolling jack) into the back of the truck, and drove home. Then, I just disassembled the lift in the back of the truck and put it in my garage piece by piece as I assembled it. Worked out great. It would have worked just as well on a car trailer, but we'd just had a winter storm when mine was delivered and the depot didn't have a ground level dock, or a forklift that could make it up their outdoor ramp in the snow/ice. So they couldn't load the lift onto the trailer. 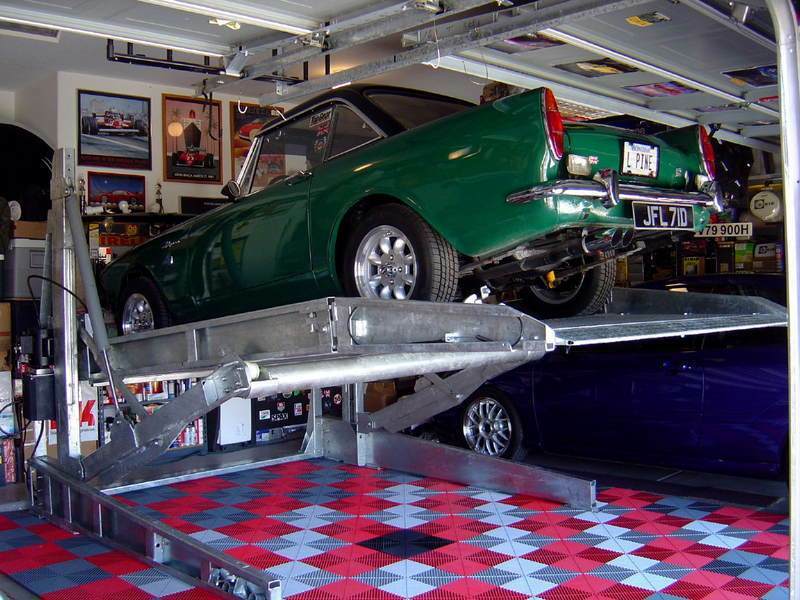 This Harding lift is wonderful and is not a maintenance lift, it has a full floor meant to be a storage lift, and clearly if I got it in a standard tract home garage it will go in just about any garage. It does need to be used on the double door side to allow room for the opener depending on the layout of course. With the car properly positioned and with two cars in place. Deddie summed it up nicely. Half of your neighbors will think you're the coolest ever, and the other half will think you're clinically insane. I went with a Rotary, myself, but honestly 80% of that was because I could get it delivered and installed. Many of the other brands, as folks have noted, show up on a truck and you figure out the rest. Having seen one put together, they're not overly complicated, but for the $500 extra it cost - it was totally worth it to not have to hit my buddies up (AGAIN) to help lift heavy objects and for the peace of mind that my car wasn't going to come crashing down that first night. That being said, I've had it 4 years now and it's held up nicely. When not using it, I wrap the end bars of the lift with a towel so that if I DO open the trunk lid it at least hits something soft and doesn't scratch the paint. Get lots of drip trays. The last thing you want is some random fluid from the top vehicle dripping down on to the shiny paint of the bottom vehicle. If you're even the least bit OCD about detailing your car, prepare for a whole new level now that you have easy access to the undercarriage. Best automotive "tool" I've ever owned.